Asian Americans demonstrate in support for justice for NYPD shooting victim, Akai Gurley. 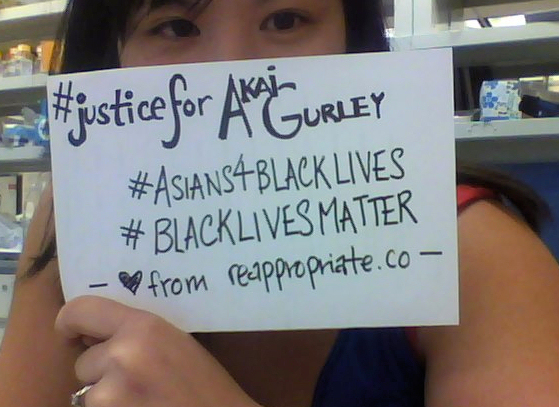 Last month, the Committee Against Anti-Asian Violence (CAAAV) helped to organize a social media-based selfie campaign to create visibility for Asian Americans who support justice for NYPD shooting victim Akai Gurley, who was killed earlier this year by rookie police officer Peter Liang. Liang, who shot Gurley during an unsanctioned vertical patrol and who failed to perform life-saving procedures in the minutes after Gurley was wounded, was indicted by a grand jury on manslaughter charges in Akai Gurley’s death. While many support Peter Liang’s grand jury indictment as a necessary first step in establishing accountability and oversight for police in the event of a suspicious civilian death, there are those within the Chinese American community who have interpreted Liang’s indictment as evidence of racism, comparing his indictment to the lack of an indictment for the White police officers in the shootings of Michael Brown and Eric Garner. In the first week of March, an estimated two thousand Chinese American protesters marched in New York City in opposition to Peter Liang’s indictment. In the coming week, organizers hope to take those protests national, with a series of demonstrations protesting Liang’s indictment planned for cities around the country. Not only is opposition to Peter Liang’s indictment frustratingly illogical, but these protests threaten to dominate coverage of Asian American involvement with what has become labelled America’s new Racial Justice Movement. Already, mainstream media outlets have generalized these protests as representative of all Asian Americans, erasing the sharp political divide within the Asian American community on this topic, and more specifically the countless Asian Americans who strongly support Peter Liang’s indictment and broader mechanisms of police accountability, and who stand in solidarity with the #BlackLivesMatter movement. I mentioned in an earlier post that part of the reason for this erasure has to do with the frustrating mistreatment that Asian Americans who support Peter Liang’s indictment have faced within our community: those of us who express this position must contend with being labelled as “race traitors” or worse. The CAACR [group, which was founded to organize pro-Liang rallies] claims that because Peter Liang is Chinese American, he is being treated differently from Darren Wilson, Sean Williams, and Daniel Pantaleo. But this possibility doesn’t mean Liang shouldn’t be tried. It just means that he does not have the privilege that the white officers have. They should have been tried too. Those supporting Liang only because he is Chinese American should know that they are not fighting racism. If the CAACR truly desires justice, it will not lobby for Liang to be treated the same as the white officers. To do so would be to ask for an ad hoc dispensation from a racist system. The model minority stereotype was also an ad hoc dispensation. Other Asian American organizations such as the CAAAV understand this and support the indictment. Akai Gurley and Peter Liang had much in common, but this is the most tragic: their lives in the balance, they were who white supremacy needed them to be. All of us would do well to remember that. There are many Asian Americans who not only agree with this position, but who see this as a critical battleground that will decide the place Asian Americans choose to inhabit in a more racially just America. Will we fight for a more equal future where no human life can be taken without consequence? Or, will we fight to defend a system that values authoritarian order over the lives of our Black brothers and sisters — the same system that thinks little of Yellow or Brown lives either? This past week, CAAAV asked AAPI civil rights organizations to take a stand in support of indictment for Peter Liang, and for any police officer who images they can take the life of an unarmed, Black civilian without consequence. This past weekend, I joined over two dozen AAPI social justice groups as signatories to this open letter opposing those within our community who demand that criminal charges against Peter Liang be dropped. We find this demand to be both irrational and offensive; instead, we support justice for Akai Gurley and an end to police violence. As Asian American community leaders and organizations from across the country, we strongly oppose calls coming from some members of the Asian American community to drop charges against NYPD Officer Peter Liang for the death of Akai Gurley. This demand is misguided and utterly hurtful to Akai Gurley’s family and to communities that have been subjected to discriminatory and often deadly policing practices across the country. We stand with Akai Gurley’s family and all those who have lost loved ones to police violence. We firmly believe that Peter Liang must be held accountable for his actions. The fact that Officer Liang is Asian American shouldn’t mean that we as Asian Americans support him unequivocally. Quite the opposite — it should compel us to think about what justice looks like and how Asian Americans can contribute to the movement for police accountability and broader racial justice. If you — as an individual or as a member of an AAPI organization — would like to add your support to this letter, please visit this link and fill out the form and share this open letter with your entire network.